In just three weeks, we'll be seeing the debut of Joss Whedon's brand new TV show about the Marvel Universe's superspy organization SHIELD. But even though we've seen the show's pilot, we still have lots of lingering questions. We caught up with the show's creators and cast at Comic-Con, and got some answers. How far in advance have they planned out this show? According to producer Jeph Loeb, the show's creators presented an arc for about 100 episodes that got everyone at Marvel incredibly excited about where this show was going. More specifically, though, they planned out the first 13 episodes of the season in a lot of detail, with a more rough sketch of the "back nine" if they get a full season pickup. And they have a sense of what the second season could be about. ABC's programming has skewed more towards female audiences in recent years, with shows like Grey's Anatomy and Revenge. Meanwhile, says Bell, the Marvel Cinematic Universe has attracted more of a male-dominated audience and mostly focuses on male heroes. But they hope that with Joss Whedon involved this show will be like a "venn diagram of what you want in a show," attracting ABC's typical viewership alongside people who love the "epic scope" of the movies. Joss Whedon says this show won't have the same huge widescreen feel as the movies every week — but hopefully the characters will pull you in anyway. "Marvel is very dedicated to building spectacle from character and they're not afraid to have people sit around and talk for a while," he adds. Just how involved is Joss Whedon? He's pretty busy making another Avengers movie, but he's involved in shaping the story, and they run every idea past him, says Jed Whedon. "We're in constant contact." His presence will be felt, adds Tancharoen. So is this show basically a procedural? Sort of, yes. According to Loeb, the show is about investigating weird and unusual phenomena in the Marvel universe — and every week, they'll assess another threat. Sometimes, this turns out to be something that needs to be neutralized, but sometimes it'll be something that needs to be protected from bad guys. "This show allows us to tell stories that are in straight-ahead procedurals," but in a different way, says Loeb. According to Bell, the show will do standalone episodes the same way that Buffy the Vampire Slayer and Angel did — the real focus will be on the emotional lives of the characters, not the case of the week. And of course, there will be "arc" episodes from time to time. Adds Maurissa Tancharoen, "Every week, there is a monster of the week or a problem of the week, that is a metaphor for the emotional challenges our characters are going through." Will we ever see Nick Fury in this show? Maybe. We will definitely connect with "Big SHIELD" from time to time, says Bell, but we may not ever see Commander Fury himself. Basically, the team flies around in their "mobile command unit," a plane that Nick Fury has allowed Agent Coulson to use, and sometimes they reconnect with the Mothership. Bell says that the feel of Marvel storytelling is "aspirational" and optimistic, and these are not cynical characters. Rather, they're "enthusiasts." Adds Bell, "They're excited about the world, and we're trying to capture that." How is Phil Coulson different now that he's the leading man? Now that he's starring in his own show, the writers are giving Agent Coulson "some authority, some swagger," says producer Maurissa Tancharoen. Coulson is "the face of SHIELD," says producer Jed Whedon. "In every film, Coulson was expanded on a little bit, and now we get to do that a little further." Clark Gregg told us that he feels like different writers and directors have created very different versions of Phil Coulson, in a kind of "chain letter" from movie to movie — so Gregg has constantly been surprised to find out who his character is this time around. When he was hired for the TV show, he went out to dinner with the writers and told them, "This is the deal: Whenever I play this guy, I always have to ask, 'Who am I this time?'" And this time around, he's a more authoritative version. Until now, Coulson has been kind of the "diva wrangler" of the Marvel Universe, but now he's more of a leader. 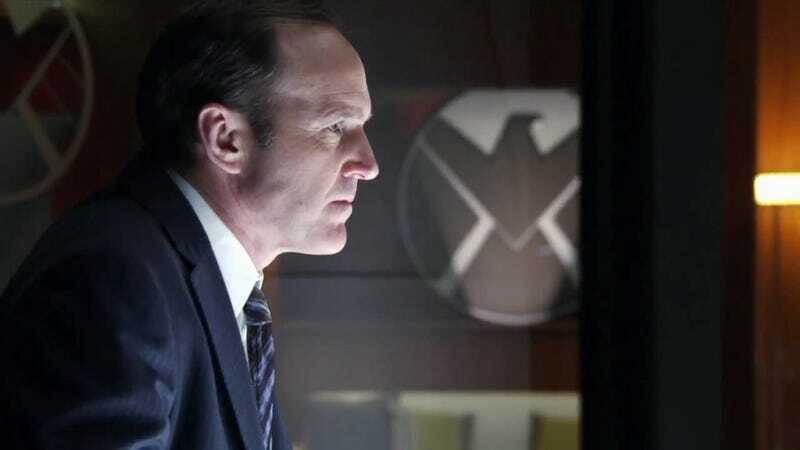 Coulson is sort of like the "father to us all," and the scientists Fitz and Simmons are constantly trying to impress him — only to have him keep raising the bar, says actor Elizabeth Henstridge. Coulson is like the "crazy uncle," says Gregg, and we'll never really know which of his hand-picked team-members he likes the best. So how is Coulson back from the dead? That's one of the central mysteries of the show — but Gregg did drop a hint. He said that when he was told his character was back, after dying in The Avengers, he wanted to make sure his resurrection wasn't something that would undermine that story. "And then Joss told me [how I'm back], and it was horrendously cool and dark," says Gregg. We'll learn more about this mystery over the course of the first season. How many obscure characters from the comics will pop up? Sounds as though a fair bit will. According to Jed Whedon, they come up with a story first — and when they have a character who has a particular superpower, they ask around, to find out whether there's someone in the Marvel universe who does that. The answer is invariably "Yes," and they've been including some of those people on a case-by-case basis. "We do it both ways," says Whedon — inventing new characters from whole cloth, and adding characters from the comics. "That makes it easy and fun." How much crossover will there be with the Marvel movies? There might be a "kernel" that you might see on the TV show that points to something in the movies, or vice versa, says Tancharoen. The goal is that people who watch the movies as well as the TV show will be rewarded, adds Jed Whedon. But you won't have people saying, "Oh, you just missed Iron Man" or anything. How many secrets do these characters have? According to showrunner Jeff Bell (Angel), none of these characters is "exactly who you think they are," and they plan to unravel the mysteries of these characters over a long period of time. Chloe Bennett, who plays the hacker Skye, says that Skye is really good at manipulating people, and what you see isn't really what you get with her. She's that rare person who's good at hacking computers and people, adds Bennett — she's like a funnier version of Girl with the Dragon Tattoo. How much of the aftermath of the Avengers' battle will we see? A lot. The Battle of New York "doesn't just disappear," says Brett Dalton, who plays Grant Ward. It's not like "New York is just fine again." And we see the impact of this event, which turned everyone's worldview upside down, on the show's characters. Joss Whedon usually writes about underdogs. How do you make SHIELD the underdog? It's something we've been joking about since the beginning. "They're a ragtag group of faceless bureaucrats who control your every move!" On some level, we'll be having our cake and eating it too, which is a delightful phrase for hypocrisy. But on some other level, we'll be broaching the issue in a way which is not trivializing it. If we're dealing with it as writers and the audience is dealing with it, then the characters need to deal with it as well. Sometimes S.H.I.E.L.D. will be the thing that makes it all better, and sometimes S.H.I.E.L.D. will be the thing that makes it worse. It's a very grey area, and that's part of what makes it exciting. Marvel's Agents of SHIELD launches on Sept. 24 at 8 PM on ABC.